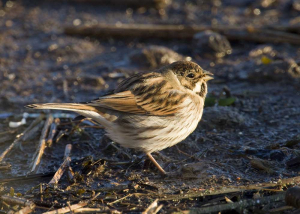 Observation - Reed Bunting - UK and Ireland. Description: Winter plumaged male. During the winter the black head is obscured by pale feather edges - these wear away before the spring, making the males appearance much smarter. Winter plumaged male. During the winter the black head is obscured by pale feather edges - these wear away before the spring, making the males appearance much smarter.